The College offers courses in B.A, B.Sc, B.Com ,B.C.A, M.Sc and M.Com. It has well equipped laboratories, a good computerised library and a vast sports field. Opportunities are provided to students to express their talents in Fine Arts and Popular Science. 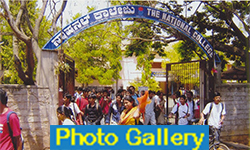 The College campus has a closed auditorium, Dr. H.N. Kalakshetra, an open air auditorium attached to it, and B.V. Jagadeesh Science Centre as centres of Culture and Science respectively which provide the necessary fora for nurturing the inherent capabilities of the students. The Kalakshetra is now a cultural centre which is also thrown open to the public when there are cultural events like, dance, drama and music. The Science Centre, inaugurated in 2002, aims at popularising Basic Sciences among students from this College and from other educational institutions as well. With a dedicated team of teachers and administrative staff, the college hopes to shape itself into a still better centre of learning for the benefit of the society. The institution also aims at inculcating values of life and discipline among students and help them scale academic heights, thus enabling them to have an overall development of their personality.